A fairy garden is a fantastic opportunity for a magical, whimsical summer project. This gardening DIY offers kids unlimited opportunities to create and imagine. It is easy to put together, inexpensive, and fun. Find a location. The location of your garden will help you decide the size of your container. The container should fill the space, but not overcrowd the area. If you choose a location in the shade, you’ll need plants that fare better without direct sunlight. Even the mini-house that you choose may go well with other outside elements in the location. Choose a container. An old wheelbarrow or radio flyer wagon that you’ve got in the garage may work. There are many options, including old pots, baskets, wash basins, or wooden boxes. Decide what works best for the design of your fairy garden. Plan your garden. Before planting and setting up other elements, draw out the garden on a piece of paper. Pick a creative theme, such as a beach garden, forest garden, or space garden. Place the elements in the fairy garden to see how it looks. Move the elements, until you’re satisfied with the look. Plant, glue, and set-up your garden with the children. Pick a mini-house. Kids will enjoy choosing or making a home for the fairy garden. Some possibilities include a birdhouse, painted ceramic house or a door on the side of a tree. 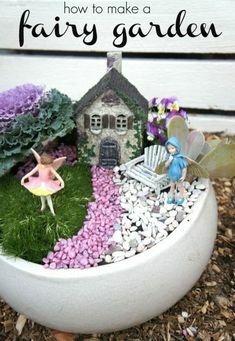 You could also choose not to use a house, allowing the accessories to make an inviting home for fairies who may happen upon your fairy garden. Add elements. There are plenty of natural elements that cost nothing, such as rocks, twigs, and sea shells. You may also find additional elements around the house to make your mini-fairy garden pop. Paint a white picket fence or create a stone walkway. Let your imagination soar! Your child may have a fun, fairy garden that can be crafted and customized all summer long.